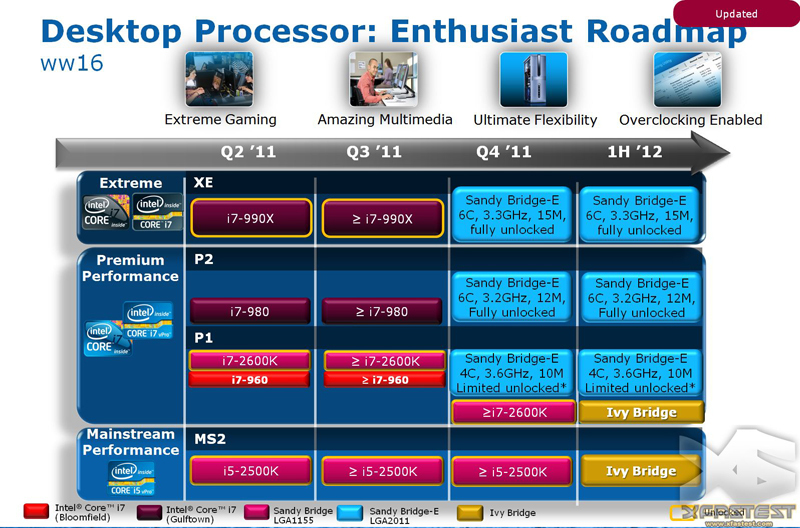 Sandy Bridge E will be arrive in Q4 2011 according to a leaked Intel roadmap. The slide below, posted by Xfastest.com, includes products through the first half of 2012. With 32 PCI Express lanes (dual 16x or quad 8x) and 14 SATA ports (Ten native SATA 6Gbps ports), this platform should be able to handle just about everything you throw at it. One glaring omission is USB 3.0, which will likely be included via an external controller. These CPUs should easily outperform anything currently on the market, but how do they overclock? It looks as though the top tier processors will be fully unlocked, ensuring that some overclocking will be possible. The lowest Sandy Bridge-E will be “limited unlocked”, which could mean all the lower multipliers are unlocked, multipliers up to a certain number are unlocked or anything else imaginable. Hopefully more details will surface in the near future sinc the P1 codenamed CPU will be the cheapest of the lot. This will likely be the most appealing to overclockers assuming it is priced at about $315 like the i7-2600k. LGA2011? A new slot again? Anybody else here miss the good old days of 775? I cant wait to see what performance this brings. Ah yes, the days where you could have a chip that physically fits but is not electrically compatible. AMD is still playing that game; they can keep it. Still no reason to go beyond quadcore for gamers. The money saved on that will go towards a video card. I am a little sad to see the 1366 hexa's will be de-throned as king.. But I will have a nice 1155 board for the new hexa to sit in, so in a sence its okay.. But still.. I noticed a decrease in memory bandwidth and latency when I moved from 4-6 cores, just like moveing from 2-4 cores.. I wonder if dual channel will be enough to keep 6 cores fed? Also I thought he move to an imc on intel decreased most latencies..though no clue on bandwidth. I also thought sandyb-e were quad channel? Not like true mattered much anyway. :soda: <--- That's me enjoying the insane performance of this platform. :chair: <--- That's me hiding from the price of this platform. I want to see how well these OC lol. Will these come with the graphics chip on the cpu? These are sure to thrash amd x6, but it will be interesting to see them against Bulldozer. If bulldozer is excellent, could these possibly come out sooner? and i thought triple channel was a waste . . .
hopefully i'll get enough money for when they come out.